We started checking our bank statements the minute this unusual English desk lamp by ‘Perihel’ Circa 1950 landed in our inbox. It was originally used as a medical ‘heat lamp’. 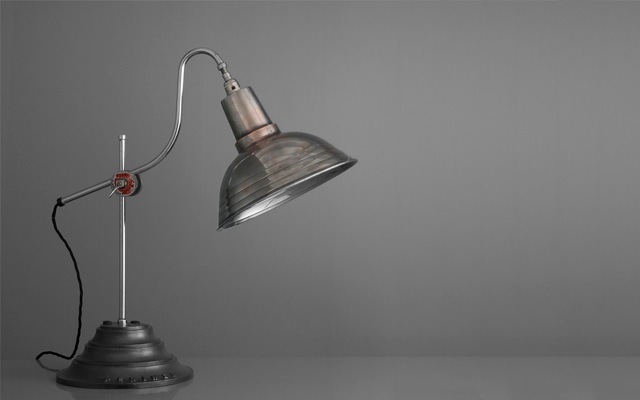 Now fully converted to an elegant desk lamp it has a stepped copper shade and chrome plated stem mounted upon a corresponding brushed and lacquered stepped steel base complete with cast makers mark. There is even a height adjustment, with rotation and articulation at the juncture between the shade arm and stem. A must for the Midcentury Modern or industrial style home office. She tells us they were originally designed for use as a portable home sun lamp in the 1940’s as a way to keep fit and healthy. It was based on the hospital versions of the lamp which you can see in action here. Light therapy was routinely used by medical professionals from the 1930’s onwards, so the advent of the portable home use versions was heralded as something of a health breakthrough in the tough wartime years.